After a nine-minute ride into orbit, Russian cosmonaut Oleg Artemyev and NASA astronauts Ricky Arnold and Drew Feustel will spend 34 orbits—about 50 hours—catching up with the orbiting outpost inside their tiny spacecraft. 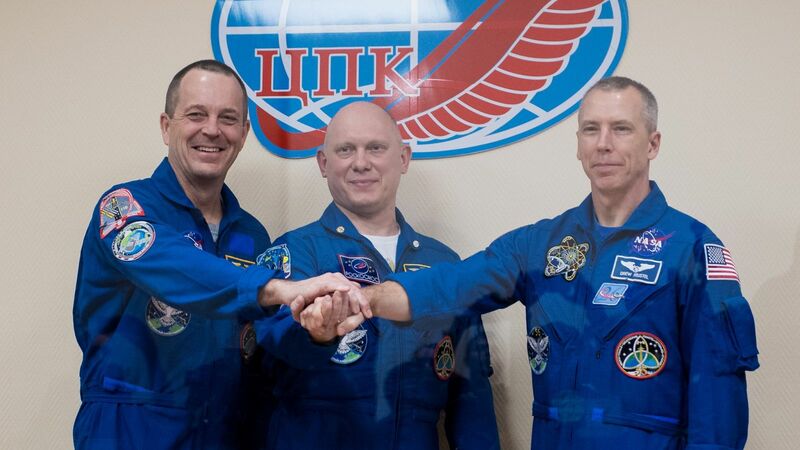 Once they dock, they will join the already-aboard Expedition 55 crew members Scott Tingle of NASA, Norishige Kanai of the Japan Aerospace Exploration Agency, and Anton Shkaplerov of Roscosmos (the Russian state-run space corporation). Artemyev, 47, previously first flew to the space station in 2014 aboard Soyuz TMA-12M as part of the Expedition 39/40 increment. During his 169-day stay, he performed two spacewalks totaling 12 hours, 34 minutes. Feustel, 52, is a veteran of two previous spaceflights. His first flight was aboard Space Shuttle Atlantis’ STS-125 mission in 2009. During that flight he served as a mission specialist and performed three spacewalks to help repair the Hubble Space Telescope. His second flight, Space Shuttle Endeavour’s final flight in 2011, saw him visit the ISS for the first time. There he performed three spacewalks to install external experiments and equipment, repair one of the outpost’s Solar Alpha Rotary Joints, and route cables. Between his two missions, his six spacewalks total 42 hours, 18 minutes. Arnold, 54, first flew into space aboard Space Shuttle Discovery’s STS-119 mission in 2009. That mission saw the installation of the station’s S6 truss and its two solar array wings. During the 13-day flight, he performed two spacewalks totaling 12 hours, 34 minutes to help install the truss segment and move a crew equipment cart. The Soyuz MS-08 trio is set to dock at 3:41 p.m. EDT (19:41 GMT) March 23, 2018, at the Poisk module on the space station’s Russian orbital segment. Once onboard they will be welcomed by the three already onboard ISS before moving over to the Zvezda module for a conference call with family and friends. It will be a busy five months for the ISS crew. On March 28, Progress MS-07, which has been attached to the outpost since October 2017, will be commanded to undock and move away from the station to begin a period of free flight to perform several experiments. The uncrewed cargo craft is slated to reenter the atmosphere and burn up sometime in April. Just a week after docking, Feustel and Arnold will go on a spacewalk to install wireless antennas on the Tranquility module, according to NASA, and replace cameras on the P1 truss segment. Not long after that, on April 2, SpaceX is set to launch the CRS-14 Dragon cargo spacecraft. It will rendezvous and berth to ISS on April 4 to spend about a month attached to the 400-metric-ton complex. In May, Expedition 55 is expected to see the arrival of Orbital ATK’s OA-9 Cygnus cargo ship. Additionally, the crew is expected to perform another two-person spacewalk. In June, Shkaplerov, Tingle and Kanai will leave in their Soyuz MS-07 spacecraft and the remaining three will transition to Expedition 56. Several days later, Russian cosmonaut Sergey Prokopyev, NASA astronaut Serena Aunon-Chancellor and European Space Agency astronaut Alexander Gerst will launch to the outpost in Soyuz MS-09 to return the crew compliment to six. Also in June, another SpaceX Dragon cargo ship is slated to arrive for a month-long mission and Orbital ATK’s OA-9 Cygnus will unberth. Just before the Soyuz MS-08 trio leaves the ISS in late August, they could see the arrival of the seventh Japanese Kounotori cargo spacecraft and—if schedules hold—the unpiloted arrival of one of the Commercial Crew Program spacecraft, although the schedules are anticipated to slip further into the year. All-in-all, it is expected to be a very busy period as in between all of these events the crew will be performing hundreds of experiments brought to the outpost by the various cargo spacecraft. To prepare for launch, Roscosmos rolled Soyuz MS-08 and the 162-foot (49.5-meter) tall Soyuz FG carrier rocket to the launch pad two days in advance of its anticipated March 21 flight. The vehicle was transported via rail to Pad 1/5, also known as Gagarin Start after the first human to leave the planet in April 1961. This will be the 137th flight of a Soyuz spacecraft. Additionally, this will be the third orbital launch performed by Russia in 2018 and the first human spaceflight of the year. NASA TV launch coverage will begin at 12:45 p.m. EDT (16:45 GMT), March 21, 2018.